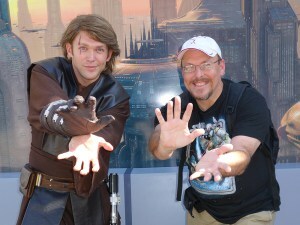 Use my character schedules at Character Locator to determine the time you’d like to meet a character. But, be sure to arrive early. Some characters may already have lines held over from previous meets. This is especially common for Princess characters. You may want to consider using one of my touring plans to optimize your character touring. 2. 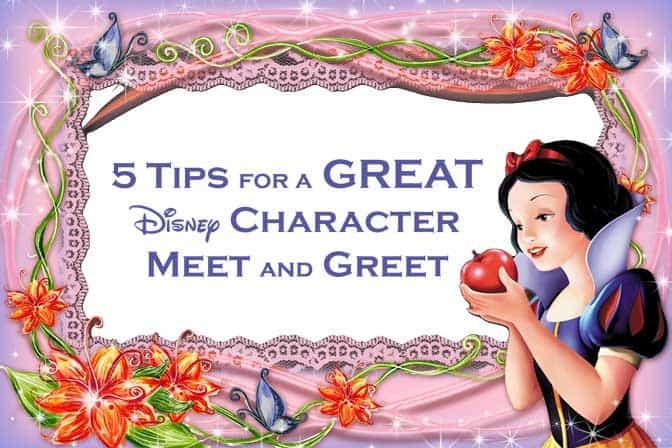 Have your item that you want autographed ready to present to the character. They will not sign items that a guest is actually wearing and characters wearing white gloves don’t like to sign in green marker as it doesn’t clean from costume easily. I recommend retractable markers for ease of storage. Only a few characters don’t sign at Walt Disney World. Here’s a list of characters who don’t sign. Fumbling around with pens, markers and books that aren’t open to a new page are time consuming and cut down on your time with the character. Don’t use hotel pens, the characters need something larger to hold well. 3. Consider something different than an autograph book. After filling about 10 autograph books we realized we could do other fun things. My daughter used to enjoy getting every Princess to sign a special hat each trip. Those hats are still very special to her. 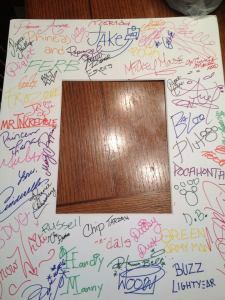 Some people have used a large vinymation, created a special memory book, had tshirts signed, posters signed and more. I thought would be cool to get all the Star Wars Characters to sign a Storm Trooper bank. If you are using something white, be sure to keep it out of the sun in a bag or the sun will fade the signatures. 4. Have that camera turned on and ready to fire. You’ll waste time trying to turn on your camera or activate your cell phone camera. I’ve taken a number of photos with a cell camera for the sake of tweeting them out, but they usually take horrible photos, especially in low light. I like to use my Sony RX100. It is the best pocket camera on the market today. It takes photos that compare to DSLR cameras but is much smaller and lighter in weight. I also own a Nikon D5200 for things like Fireworks. Take some candid shots while your child is interacting with the character. Those will be more memorable than the strict posed photos. 5. Interact with the character. Many people just ask for a signature and pose for a static photo. Try some of my interaction tips or try posing in a new (yet appropriate) way. Surf with Stitch, propose to a character, jump with Tigger or do monkey poses with King Louie. Use your time and don’t feel rushed. This may be the only time you ever see some characters. If you found this helpful, be sure to pin it on Pinterest and Share on Facebook! 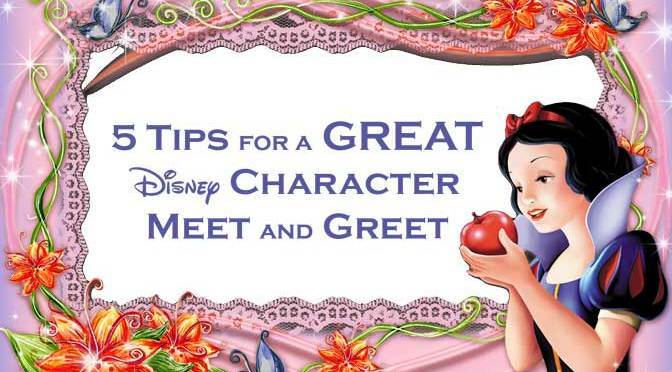 What tips do you have for a GREAT meet and greet? Wooden frames from the craft store are great too and they do not warp or sweat stain. We bought an encyclopedia of animated Disney Characters and had them sign by their picture! It will be something we keep forever. Love the “Interact with characters” tip! My 2.5 year old got on all fours with Tigger and still talks about it. Great photo, with Pooh giggling, too. I didn’t except him to remember, being so young, but it was his idea to recreate it at 4 years. Would love to see guests proposing to characters, and surfing with Stitch needs to be on everyone’s list. Static photos are fine, but it’s the one of us being goofy with Goofy that made the frame in our house. Was just at HK Disneyland two days ago (WDW trip postponed). I met the following: Anna and Elsa, Cinderella, Snow White, Alice, Donald Duck, Goofy, Chip and Dale. Anna and Elsa’s line was very long. We queued early and that was a good strategy because the lines stretch! Other guests in the line said they came the previous day for two sets, and couldn’t get to meet them at both times! We were told that for the princesses, only Anna & Elsa, Cinderella and Snow White were out. Tinker Bell was out too, but I forgot the timing which was told to me. I wanted to meet Ariel and Mulan, but they weren’t out that day. I chatted with Anna & Elsa about Hans, Marshmallow and the distance from Arendalle. Anna and Alice were very energetic and bubbly! The other princesses and Elsa were really good too. I saw Duffy and Shelliemay on Main Street too, plus Mickey and Minnie, but didn’t meet them due to time constraints. I saw Buzz Lightyear in Tomorrowland as well. Our mat boards worked great, but as a suggestion to other Disney goers. I protected ours between two foam boards, and then placed in a fitted clear bag. Then a cast member in one of the stores provided me with additional bags to place them in to protect them if the storms moved in. We just got back last night, and the heat and humidity were miserable. I made the mistake of hanging the mats off my arm as my girls’ prepared to meet Goofy, and then turn around and meet Donald and Daisy at HS. The mistake was my arm was very sweaty, and the mats picked up some of my sweat and left a bit of a stain on the mat along the picture opening. I think my mother-in-law can trim to fix, but part of me says to leave it and laugh years from now about the memories of sweating like pigs. By the way, got all but 5 of the characters met. Missed Fairy Godmother because she was a no show for her 9:20 meet, and missed Peter Pan as he didn’t meet in the afternoon. Simply forgot about the White Rabbit, and then didn’t do the Crystal Palace this go around so missed Eeyore and Piglet. We did get one Character Palooza in, but didn’t take the mat boards because it had been raining much of the afternoon. Got great photos with Captain Hook and Mr. Smee, Pinocchio, Mulan, Pochantas and Meeko, Penguin from Mary Poppins, Stitch, Chip n Dale, and Green Army Man. Could of met Belle in blue dress, too, but decided to skip because I knew we would see her later in the week. And it sounds like such a small thing — and something you wouldn’t think you’d have to tell people — but making sure that you (and your child) say a sincere “thank you” to the character is huge. From the way characters have reacted to my son, ever since he made his first visit at age 5, when he is sure to say “thank you” before moving on, it is clear that many (most?) people forget this step. 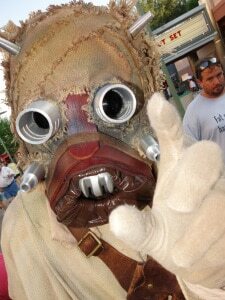 My son has gotten high fives, extra hugs, two thumbs up, and very warm comments from face characters about his excellent manners, and sometimes those extra little moments were what made the experience magical (and certainly reinforced for our son how important is always is to say “thank you!”). Great information about “other” things to sign. AND the green marker tip! I loved your photo op ideas. I usually try to ask questions of face characters for extra interaction. Leave on Thursday, and had my mother-in-law who owns her own frame shop make us a couple of photo mats for our girls to have signed. I love the photo mat idea! I will have to remember that for our trip next spring!